Artist’s Statement: As a choreographer, my creative vision explores the deepest realm of my imagination voicing personal thoughts and feelings relevant to the human condition; I am dedicated to creating works that touch the senses, express emotions through pure physicality, and produce visually striking images that embrace and inspire audiences of all ages. As an educator, I am devoted to placing the learner central to the experience and to diligently assisting each student discover his or her technical and creative potential. 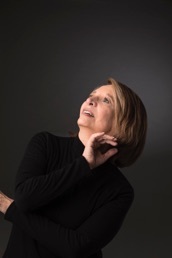 Barbara Selinger, choreographer, performer and educator, is Artistic Director of DDCdances, a company she co-founded in 1980. She has choreographed and performed since 1973, creating more than 100 major works for DDCdances and other companies. Barbara is the only Michigan dance artist awarded six Creative Artist Grants from the Michigan Council for the Arts and Cultural Affairs to create, perform and produce her work. Barbara’s choreography, celebrated for its humanity and ability to stimulate the senses through visually striking images, has been presented throughout Michigan and in Detroit, Chicago, New York City and Toronto. Barbara has more than 25 years experience in higher education where she mentors students pursuing a career in the arts, and conducts numerous dance/arts classes in schools grades K-12. Her academic achievements include M.Ed. in Dance - Wayne State University and B.A. - Anna Maria College. She has been awarded the prestigious Arts Achievement Award from Wayne State University and Teacher of the Year Award from the Michigan Dance Association, selected as one of 3 artists for the Governor’s People’s Choice Award for outstanding Michigan artist in 2005, honored by the cities of Farmington and Dearborn for her artistry and commitment to community arts programming, and is the 2015 recipient of Michigan Youth Arts Touchstone Award as educator of the year.